The banded sea krait is a type of venomous sea snake found in the tropical water of the Indo-Pacific Ocean. Although this snake's venom is ten times more potent than that of a rattlesnake, the animal is nonaggressive and only known to bite in self defense. The most common name for the species is the "banded sea krait," but it's also called the "yellow-lipped sea krait." The scientific name Laticauda colubrina gives rise to another common name: "colubrine sea krait." While the animal may be called the "banded sea snake," it's better to call it a krait to avoid confusion with true sea snakes. Lifespan: Unknown. Most snakes can reach 20 years of age under ideal conditions. The banded sea snake has a black head and black-striped body. Its upper surface is blue-gray, with a yellow belly. This snake can be distinguished from related kraits by its yellow upper lip and snout. Like other kraits, it has a flattened body, paddle-shaped tail, and nostrils on the sides of its snout. In contrast, an aquatic sea snake has a paddle tail, but a rounded body and nostrils near the top of its head. Banded sea krait females are substantially larger than males. Females average 142 cm (56 in) in length, while males average 87 cm (34 in) in length. On average, an adult male weighs about 1.3 pounds, while a female weighs around 4 pounds. Banded sea kraits are semiaquatic snakes found in shallow coastal waters of the eastern Indian Ocean and western Pacific Ocean. While juvenile snakes spend most of their time in the water, adult kraits spend about half their time on land. The snakes hunt in water, but must return to digest their food, shed their skin, and reproduce. Banded sea kraits exhibit philopatry, which means they always return to their home islands. Banded sea kraits are perfectly adapted to hunt eels, supplementing their diet with small fish and crabs. The snake has never been observed feeding on land. The krait's slender body helps it weave through corals. The snake's tail may be exposed, but the threat from predators is reduced because the tail looks much like the head. Banded sea kraits are solitary nocturnal hunters, but they travel with hunting parties of yellow goatfish and bluefin trevally, which capture prey fleeing from the snake. Banded sea kraits display sexual dimorphism in hunting behavior. Males tend to hunt moray eels in shallow water, while females hunt conger eels in deeper water. 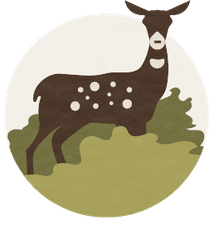 Males tend to make multiple kills on a hunt, while females typically only take one prey per hunt. Most animals leave sea kraits alone, but they are preyed upon by sharks and other large fish and sea birds when the snakes surface. In some countries, people catch the snakes to eat them. Because they spend so much time on land and are attracted to lights, encounters between kraits and humans are common but surprisingly uneventful. 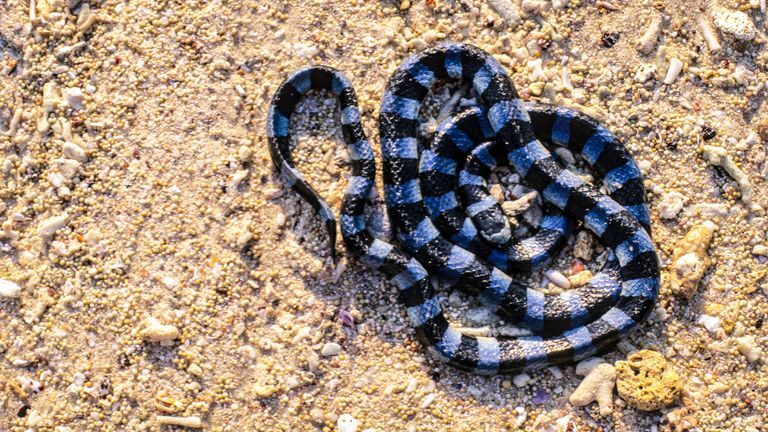 Banded sea kraits are highly venomous, but only bite in self-defense if grabbed. In New Caledonia, the snakes have the common name tricot rayé ("stripey sweater") and are considered safe enough to play with children. Bites most often occur when fishermen try to untangle the snakes from fishing nets. The venom contains a powerful neurotoxin that can cause hypertension, cyanosis, paralysis, and potentially death if left untreated. Banded sea kraits are oviparous; they return to land to mate and lay eggs. Mating occurs in September through December. Males chase the larger, slower females and entwine around her. The males rhythmically contract to produce what are called caudocephalic waves. Copulations takes about two hours, but the mass of snakes may remain entwined for several days. Females deposit up to 10 eggs in a crevice on the land. Only two nests have ever been discovered, so little is known about the how the hatchlings find their way to water. The lifespan of the banded sea krait is unknown. The IUCN classifies the banded sea krait as "least concern." The species' population is stable and the snake is abundant throughout its range. Significant threats to the snake include habitat destruction, coastal development, and light pollution. While the snake is a human food source, the threat from overharvesting is localized. Coral bleaching may impact the banded sea krait, as it may result in diminished prey abundance. Guinea, Michael L.. "Sea snakes of Fiji and Niue". In Gopalakrishnakone, Ponnampalam. Sea Snake Toxicology. Singapore Univ. Press. pp. 212–233, 1994. ISBN 9971-69-193-0.